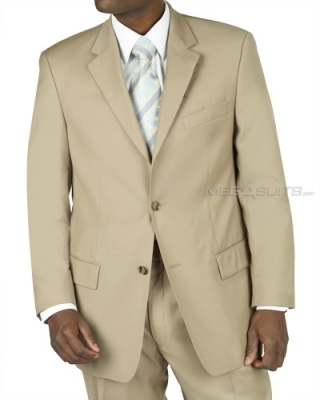 Summer suits are a good option to have on hand for those hot or muggy days. While wearing a suit can make you looking good, you don’t want to overheat. While wool is a great option for cooler weather, in warmer weather it can be quite tough to wear. Its nice to have some less stuffy options and colors. You can try to go for a lighter weight wool as an option. A blend is also worth checking out, such a silk/wool combination. While in the winter it’s a good bet to stick with darker navy and greys, in the heat you can go with some lighter colors. While most people will consider the season from Memorial Day to Labor Day, these really can be worn when the climate requires it. One way to reduce the bulk is to find unlined construction. A caveat with this is that the suit may wear a little bit prematurely, and you may find the fabric irritating depending on how sensitive your skin is. In general, a lighter color will reflect more sun, keeping you cooler. Some makers have come up with darker shades that can reflect the heat. Zegna, for example, has a reflective Cool Effect fabric that works like a much lighter color. They tend to be pricy though, over $2000 retail. A more cheaper option is a nice tan, khaki, or stone grey. If you tend to sweat a lot, you may want to watch out for the lighter colors as you don’t want to soak through. Poplin– A nice cotton or blend option. Seersucker– This is a very popular option in the southern regions. Its commonly worn by Southern lawyers. Haspel– May be the king of the seersucker manufacturers. Linen– A nice light option but it has a tendency to wrinkle.